Vince Vasquez spends an inordinate amount of time crisscrossing the southwest of the US, spending weeks on end poring over maps, digging into details of land ownership, driving tens of thousands of miles through the desert, and engaging in hours of discussions with farmers about water rights. Vasquez manages projects in Arizona and New Mexico for Water Asset Management, a private equity and hedge fund that invests in water. The firm, known as WAM, is based in New York and was founded on the idea that water should be thought of as an entirely distinct asset class. WAM invests in all things related to water, from consulting firms that have technical expertise in water and companies that manufacture pipes and valves, to public and private utilities that provide water to technology companies that make sensors for measuring pollutants in water. It also invests in water rights along the Colorado River–or what is increasingly being thought of as a type of water market. Water markets have operated in the US since the water carriers in New York City and Chicago filled casks with water from clean sources and sold them along the city streets. A different sort of water market is possible in the western US because of the system set up by gold rush miners in California. Because water is separable from land in the West, and is treated as property, it can be bought and sold like any other extractable aspect of land, from timber to bales of hay. In the western US, farmers with water rights can be paid to watch water go by their diversions and forgo their right to divert that water from their own fields, either short term–as a water lease–or permanently, as a sale. These farmers can and occasionally do sell or lease their water rights to other farmers; or more lucratively, they sell or lease to cities or industries that often are willing to pay much more for water. Water use in the West of the US has always been dominated by agriculture. Even though most of the population growth in the western US–which has more than quadrupled in the past century from 70 million in 1900 to over 320 million in 2014–has primarily been in cities, irrigation still makes up more than 80 percent of water use. This is due to the appropriation doctrine: because agriculture arrived first, the most senior water rights are invariably held by farmers, who often sold or passed them down to their children along with the land. The result is that farmers own most of the hydrologic property in the West. As urban populations grew and municipal demand for water increased, cities have had to get in line for water with everyone else, behind a long list of senior agricultural water users. But cities and big corporations in industries such as mining are typically willing to pay a premium to cut in line. The low supply and high demand sparked the development of water rights markets as early as around 1890, when the City of Colorado Springs went to court over one of the state’s earlier sales of water from irrigator to municipality. Although it had a water right and pipeline intake on a tributary to Fountain Creek, Colorado Springs needed more water for planned growth and purchased additional water rights from an upstream irrigator. When this sale of water rights was challenged in court because it would involve changing the use of water from irrigation to municipal purposes, the Colorado Supreme Court said the sale was legal because a water right is “the subject of property and may be transferred accordingly.” With this case in Colorado, and similar treatment of water in cases in other western states, water rights officially became a tradeable commodity. We buy and sell bread by the loaf; we buy and sell oil by the barrel. Water is bought and sold by the acre-foot, and at the turn of the twentieth century the market for water began growing rapidly. By 2015 about 1.8 million acre-feet (MAF) of water was traded each year, and the total value of those trades reached just under US$800 million. While most of the market activity was in California, Idaho and Arizona were hubs of water swapping as well: not to be outdone in anything, the water market in Texas was growing rapidly. Most of the sales in the West are from agriculture to municipalities, at prices anywhere from under a hundred dollars up to a few thousand dollars per acre-foot of water. But specific transactions can reveal just how valuable water can be to specific buyers under specific conditions. In 2014 one of the world’s largest mining companies, FreeportMcMoRan spent US$1.3 million for 90 acre-feet of water–a shade under US$14,000 per acre-foot–for operations at a copper mine in eastern Arizona. This would be a prohibitively exorbitant price for agriculture, but it is just a necessary cost of doing business for a profitable international mining operation dependent on water. Vince Vasquez’s work for WAM is finding opportunities to buy water rights–and often the associated land– with an eye toward selling them at a profit sometime in the future. One of WAM’s earliest ventures into the western water world was in Arizona in the late 1990s. 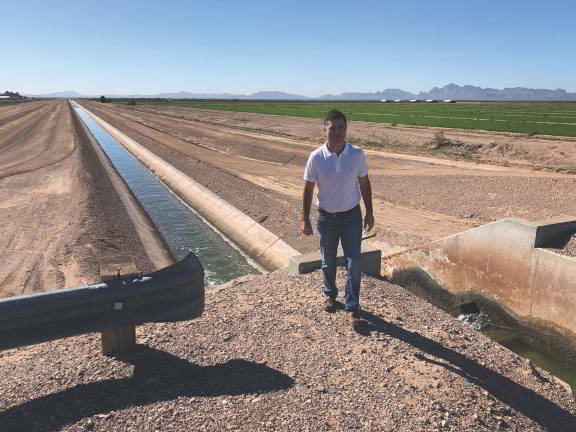 The founder had his eye on water from the recently completed Central Arizona Project (CAP), which had just started delivering water to the Harquahala Valley Irrigation District. In Harquahala, the land itself was not particularly valuable for many crops. At the time, cotton was selling at 39 cents per pound, but it cost 42 cents to grow with irrigation. However, Harquahala sat just outside the western fringe of Phoenix’s suburban sprawl, where water was in high demand. Land that initially sold for US$400-600 per acre went up to US$1000 per acre once the CAP water arrived. When WAM bought the land and associated water rights, it used some of the water to irrigate agriculture, but sold much of it for more valuable–or at least more profitable–use in cities and industries. The perfect deal for Vasquez is to find a farmer looking to sell out completely. This situation gives Vasquez maximum flexibility for both the land use and the water use; he could sell the water outright, or he could update the farm to allow for growing higher value crops with the available water. “Farmers are water rich, but cash poor,” says Vasquez. “Whereas we have a cheque book and an appetite for risk.” For farmers who want to keep the land but need cash, Vasquez structures deals to buy the land but then leases it back for a period of time to allow the previous owner to continue farming. This business model does not translate into the deal known as “buy and dry”–buying the land, selling the water, and abandoning the farming operations in the process. Rather, Vasquez buys the land and makes the farms operational. He spends his days doing the nitty gritty to make the farms that WAM has bought fully operational and as hydrologically efficient as possible. Why pour so many resources into making farming in the Arizona desert more efficient if you’re in the business of selling water? First, these particular water rights are connected, by the Colorado Rivera and the CAP, to the ever-sprawling suburbia of Phoenix. This means that every acrefoot of water Vasquez saves on the farm is transferable– sellable–in Phoenix, hundreds of miles away. But perhaps more important, the farm Vasquez is updating is along the Colorado River, and it has been irrigated with Colorado River water since before the 1922 Colorado Compact. The water rights from the farm are referred to as “present, perfect rights”–the most senior, inalienable rights of the Colorado River system. Because Arizona had to move to the back of the water line behind California to get CAP-funded water flowing, the Central Arizona Project is always in danger of being cut off during a drought. But the water rights that Vasquez is developing, and potentially selling in the future, are equal to some of California’s most senior rights and thus are inordinately valuable in Arizona. He wants to demonstrate that he is putting the water to beneficial use and thus secures his rights before he can sell them. Water markets often come under fire from opponents because of their potential for deals leading to buy-and-dry situations, when firms sell all the water and abandon the land to a dusty, useless future. But the approaches that WAM and Vasquez are using–keeping farms operational and practising rotational fallowing to make some water available for sale or lease–can generate multiple benefits. Thanks to these more innovative approaches, cities can meet at least some of their growing water demand, and farm communities can stay in business and enjoy continued productivity. In other regions, similar approaches have been used to release water from agriculture and keep it in the streams for environmental purposes. Non-profit environmental groups increasingly use water markets as a way to accomplish their conservation goals. This is an underappreciated aspect of treating water as property. Despite criticism, the water market has proved to be a mechanism for realising water conservation benefits–as long as environmental groups are willing and able to pay as much for water as other farmers, cities, or water traders like Vasquez. Markets allow water to be reallocated to where it is most valued, and some basins yield enough water to be bought and sold to meet the needs of different interests. Previous articleHold back the waters – for cash? Next articleCan nutrient pollution markets bring aquatic ‘dead zones’ back to life?